The pressure on truck capacity is coming from all angles. A shortage of qualified drivers could be the most serious concern. The American Trucking Associations estimates the industry will need 890,000 new drivers over the next decade – an average of 89,000 per year – to replace those who will be retiring and to keep pace with freight growth. Transportation companies wield pricing power, as freight demand is outstripping capacity. The DAT North American Freight Index was up 18% year over year in June. Monthly spot market rates in DAT’s network of load boards increased 29% and contract rates were up 19% for vans during the same period. Raising prices is not the only solution to capacity shortages, however. To create more capacity from available resources, transportation companies are pulling new levers by using business intelligence, route planning, and asset management technologies. Truckload refrigerated carrier Navajo Express is focused on growing its dedicated and regional operations by increasing asset utilization and home time for drivers. Currently, about 50% of its refrigerated business is dedicated and the remaining half is split evenly between regional and over-the-road operations. 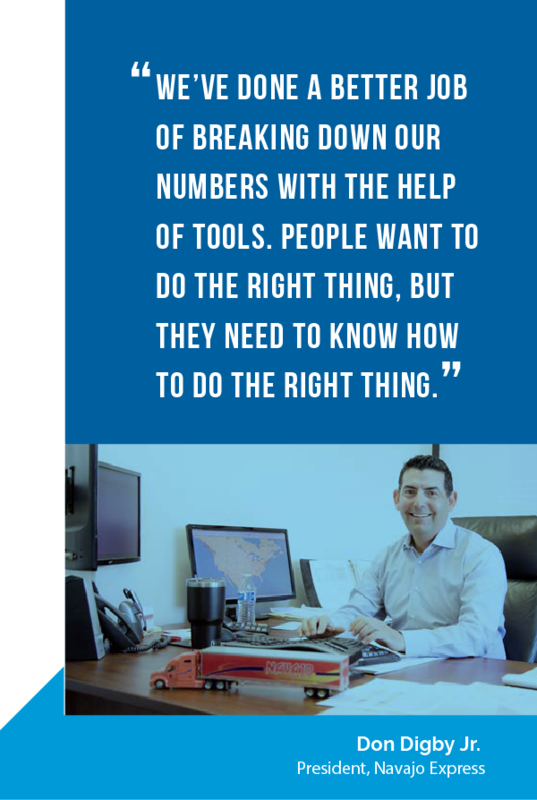 In April of 2018, the company implemented a new business intelligence tool from MapGraphiX to give office staff key metrics and data visualizations to make load planning decisions that positively impact driver retention and network profitability. According to Don Digby Jr., President of the Denver-based company, which operates more than 1,000 trucks and 3,100 trailers, Navajo Express has done a better job of breaking down their numbers with the help of tools. People want to do the right thing, but they need to know how to do the right thing. The company decided to invest in the technology after enforcement of the electronic logging device (ELD) rule had leveled the playing field. Navajo Express has been running electronic logs since July 2008. MapGraphiX creates map visualizations by pulling data and insights from multiple sources. One is its Netwise application from TMW Systems, which forecasts where the company’s trucks and loads will be in the next five days based on historical shipping patterns. Says Tim Staroba, Navajo Executive Vice President, the information is used to understand if the company is putting too much or too little capacity in certain markets. The system is able to tell what capacity will look like in the future based on customer patterns and current freight in the systems and where trucks will be landing. The MapGraphiX software also extracts dwell times at customers and other relevant data from the company’s mainframe Innovative Enterprise Software (IES) platform, also from TMW Systems. Since April, Navajo Express has improved its operating ratio by four points and reduced driver turnover. Going forward, Digby says the technology will be helpful to strategically match customers to its network in terms of driver friendliness, transit times, dwell times and other important criteria. GPS-based breadcrumb reports have been a staple in fleet management technologies for years, but the utility of these reports is limited to assessing past performance. To identify where and when capacity will become available requires tools that deliver forward-looking information. New route-planning technology can accurately predict arrival times at planned stops. This information is useful for identifying loads that will be late and for eliminating guesswork and manual data entry in the trip-planning process for drivers. As part of the load planning process, fleets typically require drivers to send macro messages to update their projected time available (PTA). Drivers make PTA estimates by considering future transit times, hours-of-service breaks, fuel stops and detention times for loading and unloading. According to Ray West, Senior Vice President and General Manager of TMW Systems’ transportation management software (TMS) product lines, load planners and dispatchers use the driver PTA estimates to assign work. If the PTAs are inaccurate — and they often are — carriers miss opportunities to assign drivers an extra pickup or delivery that have available time. Without a solid ETA, dispatchers and load planners are hesitant to make a load assignment by not knowing if a driver will make it for not he says adding, their reluctance may be contributing to turnover. For drivers, one of the most frustrating things is waiting for the next load. TruETA is an integrated cloud-based planning tool from TMW Systems that accurately and automatically calculates ETAs for loads and driver PTAs, he says. 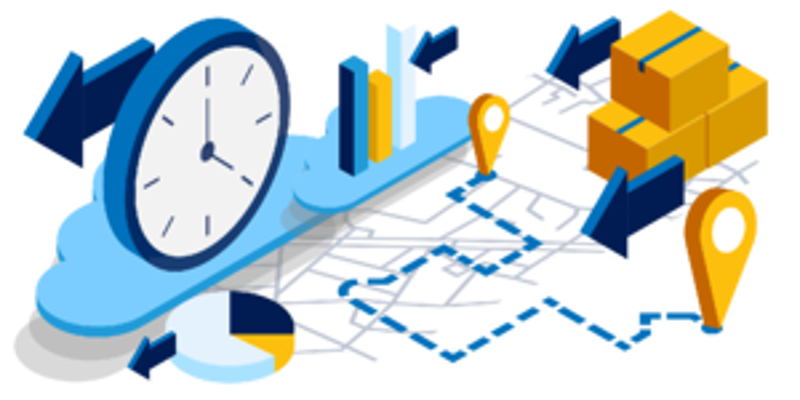 The tool does this using locations and hours-of-service data from mobile communication units and trip details from carriers’ TMS systems — stops, average dwell times and more. West explains that the tool recalculates ETAs continuously for locations on a truck route with every position update from the mobile communication system; with the most recent version of TMW TruETA, customers can save time money by detecting out-of-route and out-of-corridor events. 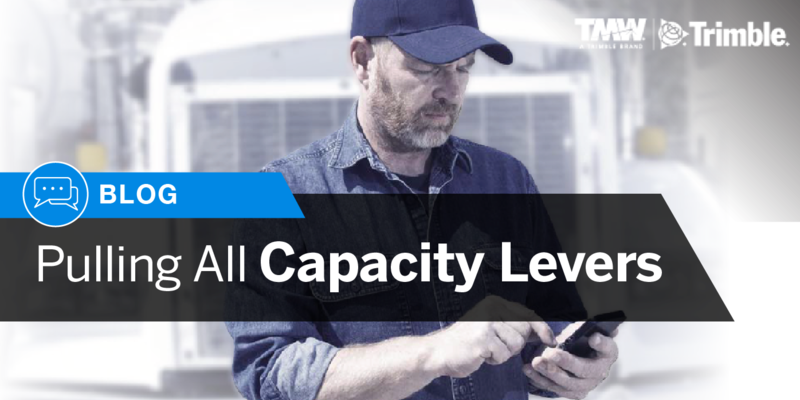 To make the most of available capacity, fleets are also using advanced systems that simultaneously evaluate all possible combinations of driver, equipment and loads in a network and factor in all capacity constraints. 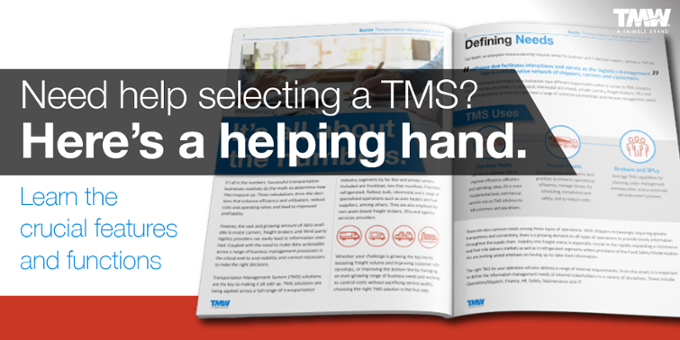 TMW Systems offers MatchAdvice, an automated load planning software for truckload carriers. The software determines optimal driver and capacity resources for loads to deliver the best solution for the entire network. For truckload operations, the software will free up capacity otherwise undetected. For companies with multi-stop routes, the TMW FinalMile software finds the optimal route plan and sequence of stops that maximizes use of available capacity. Transervice, an asset-based third-party logistics provider based in Lake Success, New York, uses TMW FinalMile software to create consistent schedules for drivers and cost-saving solutions for customers, says Tom Poduch, the company’s Senior Director of Logistic Design and Technology. Where possible, the company sends drivers work assignments and routes in advance. On a quarterly basis, the company will eliminate all existing distribution, delivery point or resource constraints and perform “what if” scenarios. The resulting analysis will evaluate different cost-saving scenarios, such as having more flexible time windows for pickups and deliveries, and share the results with customers. Poduch indicates there is a desire to share all of findings, results and data with clients to help client partners succeed, and identify potential gaps that can be filled. Transportation providers also use advanced software to increase capacity by consolidating loads and using all transportation modes and routing options. 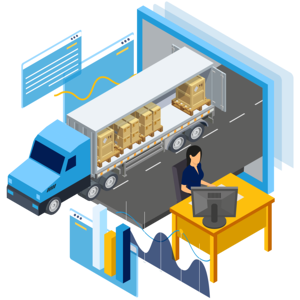 The 3Gtms software system is primarily used by freight brokers and third-party logistics firms. A feature in the system consolidates inbound and outbound orders from multiple shippers at consolidation points, such as a local warehouse, and routes the orders in larger volume shipments, says Chuck Fuerst, Vice President of Marketing for 3Gtms. When making deliveries, drivers often lose productive time unloading or searching for empty trailers to take to their next load appointments. If no empty trailers are available, office personnel may begin cold calling other customers in the area to locate empty trailers. Some motor carriers and logistics providers are keeping drivers moving to create more capacity by effectively managing trailer pools. U.S. Xpress equips its trailers with a tracking system from SkyBitz with cargo sensors. One of the nation’s largest truckload carriers, the Chattanooga, Tennessee-based company is using the information to predict when trailers will be unloaded and ready for pickup, says Aaron Woods, the company’s Manager of Trailer Management. The SkyBitz system is integrated with U.S. Xpress’ custom transportation management system and with a mapping software tool from ESRI. With the ESRI software, Wood sets up geofences for tracking arrivals, departures, turnaround times and trailer inventories by customer location and by geographical planning regions. Woods stresses that the big thing that bites any carrier is having loaded trailers going into markets with no loaded freight out. The company is managing trailer counts in each planning region to maintain the balance of trailer capacity in its freight network. At times, U.S. Xpress will use secondary carriers and railroads to reposition its trailers in its network, he says. In the three years U.S. Xpress has been using the SkyBitz trailer tracking system, its trailer count has gone from 17,000 to approximately 14,000 by increasing efficiency and capacity in its network, Wood says. With the SkyBitz system, U.S. Xpress can also identify trailers at locations that have not moved for an extended period. These events signal possible mechanical defects on trailers that cause drivers to not hook up. U.S. Xpress is also increasing trailer capacity by monitoring their use by the third-party carriers and shippers that have interchange agreements. The system tracks where trailers are picked up, dropped and how many miles they moved. With this information, the U.S. Xpress can efficiently bill carriers for authorized or non-authorized use of its trailers. Current market conditions make it easy for transportation companies to raise rates, but some are chasing a bigger opportunity. Navajo Express, for instance, is using its technology to identify customers, freight and lanes that are strategically aligned with its network to improve efficiency and driver satisfaction. Let us help you figure out how to manage your costs, contact us today.